There's lots going on in the gamebook world. 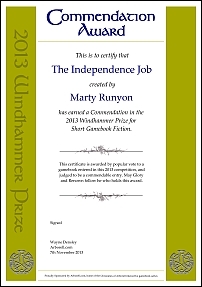 First of all, the Windhammer results are in! 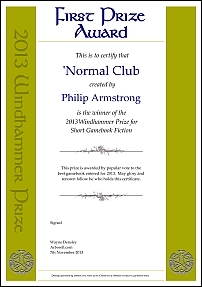 Congratulations to the winner, Phillip Armstrong for his entry, 'Normal Club', the merit award winners Ramsay Duff (The Scarlet Thief) and Paul Struth (Out of Time) and the highly commended winners, Marty Runyon (The Independence Job), Andy Robinson (Tipping Point), and Nicholas Stillman (Gunlaw). Also, everyone who entered deserves congratulations for putting the time and effort into their entries. As the Winhammer competition has progressed, the gamebooks have become more and more innovative in every way (system, storyline, writing style, setting, subject matter) and I love reading all of the entries. I'll be making video reviews of the entries and posting them later on. I did not win, but as I said in my video, I did not think that I would. My gamebook was entered to demonstrate another facet of the gamebook gem that was around in the 50s and 60s before there were actual gamebooks (for more examples, go here), but seem to have been largely neglected since actual gamebooks were released. I wanted to demonstrate that modern technology could make these gamebooks relevant again (as this review mentions, it would be great as an app). I got some great feedback from it, which is another reason for entering the competition, so I would also like to thank those people who took the time and effort to write some feedback, especially since there were 14 entries. The entries are still all on the page, so check them out. 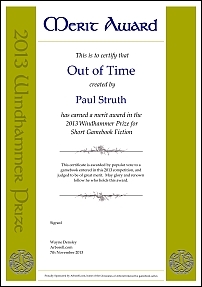 You can read all of the Windhammer entries (and there are quite a few of them, now) here. In other news, there are still plenty of other great blogs to check out on The Gamebook Feed. There is a new one called Ludus ex Libris (it is in English), where you can read about a playthrough of the masterful Heart of Ice. Also, you should try Marsten's blog where he has had some time off in September, but has returned with a vengeance and you can read his current post which is a playthrough of Tower of Destruction or his own gamebook - Choose Your Own Drunken, Insane, Drug-fuelled Rampage! And finally, Sorcery! 2 is out! And it is amazing! As I said of my review of part 1 in issue 12 of Fighting Fantazine, as well as keeping all the classic scenes and adding to them, there were also a few more plot features such as goblins looking for special metal, spirit guides and magic being woven from the stars. Part 2 really turns this up a notch with loads more encounters and features, such as being able to make up your own spell, learning more about the nobles of Khare, giving twists to harmless encounters in the first book (such as the scholar), being able to go back in time if you fail, Swindlestones (an addictive little subgame), getting to know Vik a bit more, being able to switch gods (and I get the impression that it won't lead to sudden death in book 4), and having an epic end where you have to fight off an invasion single handed. There is loads more freedom in this game where you get an impression of being in a living, breathing place. Once again, all the old scenes from the original are there, sometimes with a twist, and not just because there are no random elements (apart from Swindlestones). Inkle have done a great job with their programming - one feature involves instead of having discrete sections for each occurrence, there are different fragments of section which are put together when relevant. For example, if you have the enchanted compass, and you are near one of the bearers of the North Gate spell lines, you get a paragraph telling you that it is pointing in a certain direction. This allows greater freedom in the game and allows several encounters to be different depending on your past actions. I will be doing a more in depth review at a later point (probably in Fighting Fantazine), but for the moment, download it yourself. And if you haven't already, download the first one, so that you can play Sorcery! 2 with more money and items (you won't regret it, even if it's just so you can buy an awesome sword for 40 gold pieces. With this sword, combat becomes a LOT easier). Plenty to keep you amused and to guarantee happy gamebooking! Hey Stuart, I've decided to follow your lead and launched a new blog - 'The World of Fighting Fantasy' (http://worldoffightingfantasy.blogspot.co.uk/), where I'll be discussing anything and everything to do with FF and Titan. Looking forward to reading all of your posts! I've added you to the Gamebook Feed.